May You Accomplish Your Goals For the Weekend, and have some fun too! 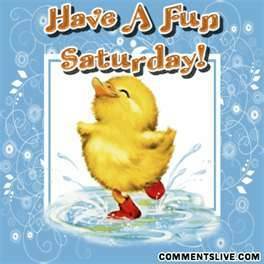 It's Saturday, WooHoo! Made it through the week, and here is the weekend . . . Whew! Was it a long week for anyone, or a short week? My week went by pretty quickly. Did I accomplish everything I wanted to? Not fully, but I sure got a lot of it started which is good, and not too many disappointments. As I had commented to a good friend of my once, the smaller goals are easier to achieve than the bigger goals. If you set your goals to high, and don't accomplish them you will be disappointed, and become discouraged. If you set smaller goals for yourself it is easier to achieve them, gives you a feeling of accomplishment, and you are ready to set another goal to continue on. Big weekend in town for us here, Railroad Days. Rides, swimming, parades, flea market, local vendors, and etc. Didn't make it today. Will I tomorrow? Not sure yet. 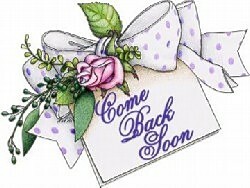 House will be empty tomorrow, and it gives me opportunities to work more without any disruptions too. It's Saturday out, bit cooler, but nice. Enjoy this beautiful day everyone, and may you accomplish your goals for the weekend. 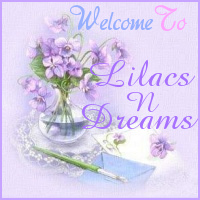 Thanks for visiting with LilacsNDreams, and see you all again soon. Have a super weekend!